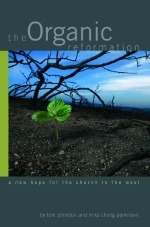 I recently finished reading The Organic Reformation by Tom Johnston and Mike Chong Perkinson. I have to say, while the book isn’t the greatest book ever written, it is unquestionably a timely book worth reading. It’s thoughtful, well-reasoned and has some theological depth to it. The Body of Christ in the West has [a genetic flaw] – it is unhealthy through flawed spiritual DNA – and it can’t reproduce. Many are Christianized, know the Bible, the principles of holy living, but have not met Christ or do not meet with the Christ daily – instead meeting with the principles and practice, and not the Person. The compartmentalization and mechanization of the modern Western Church is resisting the natural life-flow of the Kingdom. Churches are now processing factories and production plants, attempting to mass produce Christians through their programming. We have nullified the call to discipleship by substituting a call to belief and attendance. The culture is slipping into the hands of the Enemy. The Church has been self-marginalized and continues to decline in the West – the only place on the planet where it is not growing. Many ‘leaders’ in churches are simply mid-level program managers, and not missionally focused at all. If you don’t buy this diagnosis then the book is probably not worth reading. However, if you’re in agreement that something is not quite right, that the Bride of Christ is a bit beleaguered, then this book is worth a read. And here’s why. Many of the books that attempt to fix the Church’s woes prescribe pragmatic fixes. Johnston and Perkinson buck this trend by prescribing a principle. And in my mind, a principled solution always trumps a pragmatic solution. The Irreducible Core (IC) functions as a powerful and simple framework that allows every pastor and leader to frame their ministry around the heart of Jesus. The beauty of the IC is that it can flex into a myriad of traditions and forms and still be the IC. We think you can do more than this and be a Christian. However, we do not think you can do less than this and be a disciple of Jesus. When you think about it, that’s a pretty radical statement! If every believer were to reorient life around this Irreducible Core there would be verifiable outcomes in the life of the disciple—think metrics here. They would believe what Jesus believed (transformed mind), live as Jesus lived (transformed character), love as Jesus loved (transformed relationships), minister as Jesus ministered (transformed service), and lead as Jesus led (transformed influence). Those are soft metrics indeed but metrics that get us much closer to real church health than the hard metrics most churches rely on. In short, an IC way of life would lead to a movement of disciple-making disciples. And that, in my mind, is a healthy church. Thought blockers (2 Corinthians 10:3-5) – inculcated ways of thinking that have become encrustations on the ship of the Kingdom. Theological blockers (John 5:39-40) – theological, doctrinal or worldview issues which prevent an organic movement from being formed. Cultural blockers – church and denominational cultures, perhaps originally birthed in revival or renewal, or even the Protestant Reformation, which now stand in the way of the future thing God wants us to do. Systemic blockers – within each group, church, network or denomination there may be systemic things present that can restrict the life of Christ moving. I think their assessment is right on; I’ve seen these blockers operative in the audiences I’ve addressed. I just wish they had taken more effort to expand and explain these things as well as share how they’ve dealt with these issues when they have faced them. Again, there is much to commend in this book and not much I disagreed with. If you are tired of pragmatic solutions to doing church, this book is for you. If you are a “submitted subversive” and in the position of leading church, denomination, or organizational change, this book is for you. If you long to see the Kingdom Way of Life lived out in your family, this book would be a good place to start. Bottom Line: The Organic Reformation is a book worth reading a second time, which makes it better than most church books out there.